A stay at The Dylan Amsterdam is the next best thing to living in a canal house on the Keizersgracht. Taking a boat ride on one of Amsterdam’s historic canals is close to the top of any to-do list for visitors to this city. And gliding through the waters of this “Venice of the North” you can’t help but fantasize what it might be like to live in one of the old townhouses that grace the shores. The beautiful buildings on the Keizersgracht (one of three major canals specifically designed for residential development) were constructed during the 17th century, called the Dutch Golden Age, because of the Netherlands’ international prominence in trade and culture. At that time, the townhouses along the Keizersgracht housed some of the wealthiest merchants; these properties still remain among the priciest real estate in the city today. Prior to our AMA Waterways Tulip Cruise that embarked from Amsterdam, we were fortunate to stay at The Dylan Amsterdam for one night and the better part of two days (due to their kind early check-in policy). This intimate, family-owned boutique property with 40 rooms and suites is centrally located on the Keizersgracht Canal. With only modest signage outside, The Dylan is comprised of two adjoining townhouses set behind a small, gated courtyard with a bike rack outside the front door (Bike racks are ubiquitous in this city). Reception takes place at a massive black Parsons table in a room furnished in black and white. As we were led to our room (Room 24), we walked up a few steps past an inviting bar and lounge area and through one of the hotel’s two restaurants, Brasserie OCCO, which is open for casual dining from 7:30AM to 11PM. After entering a small elevator, we reached the second floor were we were led down a hall to the door of our room, which was located at the rear of the building. To our surprise, behind the door was a rather steep, spiral staircase that wound its way up to our attic suite on the top level under the gables. (The feel of the staircase construction was reminiscent of our subsequent visit to the nearby Anne Frank House). Furnished in beige with white walls and light-colored woods, our lofty minimalist-style suite was spacious—with a bedroom alcove (set behind an armoire/wardrobe closet) and an expansive living/desk area with two full-length sofas facing each other. A set of windows overlooked the hotel’s interior garden courtyard with laurel trees; the windows on the other side faced the backyards of neighborhood townhouses on the street behind us. Our one-of-a-kind suite (no two rooms in the hotel have the same design or décor) had been completely gutted and renovated. The modern en-suite bathroom had a stone counter, shiny nickel hardware, a Rainforest shower, and a full tub at the other end of the room. When tucked in our bed (with dimmer switches on the night tables beside us), we were able to see the stars and moonlight shining down from the sky. Except for the room’s building’s contours and facade, one might have never suspected the property’s rich history. First constructed in wood in 1613, the building was rebuilt five years later to create a permanent stone theater, the first in the Netherlands. Ariana Nozeman, the first female actress to perform on stage in this country, did so here. Antonio Vivaldi (yes, the composer of the “original” Four Seasons) conducted the orchestra in this theater on the auspicious occasion of its 100th anniversary. Unfortunately, during a performance at the theater in 1772, the entire building burned down sparing only the main entrance gate. A year later, the site was sold to the Regents of the Roman Catholic Church who rebuilt it as a refuge for the elderly and poor, called the Old and Poor People’s Office. The same church foundation retained ownership of the property for more than two centuries until it was sold in 1998. It was renovated and reopened as The Dylan, a luxury hotel, in 1999. The highlight of our stay was dinner at Vinkeles, the hotel’s Michelin-starred restaurant, named after a Dutch painter and located a short flight of stairs down from Brasserie Occo. We ordered off the regular menu but Vinkeles also offers multi-course tasting menus paired with wines. Our meal, a creative mix of contemporary and classic French cooking, offered a mélange of delectable tastes coupled with exceptional presentation and flawless service. Many of the ingredients were seasonal and locally sourced. Three old wood-burning ovens lined the brick exterior wall of the dining room. These were part of the bakery operated by the church foundation to offset the costs of housing the poor souls who lived within these walls. The nine tables were nicely spaced in the comfortable, beamed-ceiling room with brick floor. With only one seating each evening, Executive Chef Dennis Kupers and Maitre D’ Casper Westerveld have created a hard-to-book but pitch-perfect gastronomic experience no less exciting than a night of great theatre. Our meal was a feast for the senses, served by friendly, knowledgeable and unpretentious wait staff professionals. For dessert, the very personable and humble chef invited us to enjoy that course at his small Chef’s Table in the kitchen downstairs, which gave us a behind-the-scenes glimpse of the hard-working and talented staff. A novel spin on high tea that’s popular in many fine hotels, The Dylan has created a late afternoon (3-5PM) “high wine” experience in its Lounge, leading guests through guided pairings of four small seasonal dishes with wines. It was a relaxing and delicious way to wind down from the day in front of a fireplace, as we sampled different wines and chatted with other guests. Michelle, the lovely waitress/sommelier-in-training, explained each of the dishes and wines she poured. The location of our home-for-a-day couldn’t have been better. In the short time we were there, we were able to take advantage of our neighborhood, shopping and having breakfast in the charming de negen straatjes (nine streets) district with its galleries, boutique shops, eateries and bars. The hotel was only ten minutes away from the Anne Frank House, and conveniently located within walking distance of the flower market and major museums. As bespoke as the setting and as personalized the service, The Dylan feels totally warm and welcoming. Living here, even for a night or two, allows you to feel as if you are a veritable resident of a canal house although everything inside has been updated to appeal to 21st century five-star luxury hotel tastes and sensibilities (even free wireless throughout the hotel). Not only the hotel but also this vibrant neighborhood has an incredibly rich history dating back generations. I later read that Peter the Great stayed at house number 317 and John Adams stayed at house number 529. A member of Small Luxury Hotels of the World, The Dylan offers its guests an unforgettable, contemporary twist on the quintessential canal house stay as well as a brush with history. Disclosure: The Dylan Hotel hosted our stay and we paid for our meal at Vinkeles. Any opinions expressed in this piece are our own. What a magical place to stay! Thanks for sharing, Irene. Yes, a very special experience! Looks like a really nice experience Irene, and what a great location. I love eating pretty food with a sense of humor, and I’d say Vinkeles is a restaurant where I could be quite happy. They would have had me at the ‘pearl’. A serious chef who doesn’t take himself too seriously is the best! Heavenly! The Dylan looks incredibly chic and luxurious and the food…OMG! Not only was the cuisine a feast for the eyes, it was delicious as well. Lucky you!! That food looks too perfect to eat! What a lovely place to stay, and in a perfect location. I would point out that the winding, narrow staircase you remarked on is completely standard in Holland. Pretty much all houses have staircases like that, even brand new ones. What an incredible journey and the meals look astounding. There’s been such an explosion of plating creativity and small plate artistry as of late and now I know where in Amsterdam. Having watched a couple of International House Hunter episodes with Amsterdam canal properties featured, I was totally unprepared for the innovative design of this property’s interior. Just amazing use of space. The food looks to die for, particularly the whimsical presentation of the sea bass dish. What a memory for you to think about long after! Thanks, Betsy! I love that show, too! What a great place to stay! Being able to walk to local shops and restaurants is a real plus ☺. The “high wine” spin on high tea sounds enticing – who isn’t ready for a glass after a day of sightseeing! The one “first-world problem” was that tea was so close to dinner time and the high tea could have been a meal in itself. But we didn’t want to miss the experience! The Dylan and Vinkeles look and sound incredible. There’s something I love about canals- pair it with a boutique hotel in a historic building and I’m in heaven. On our river cruise, Bruges was another city we visited that sits on canals. What an experience to set you in the time and mood of the place. I loved the view of the courtyard – so atmospheric. I also couldn’t help but drool over the food, the sea bass among others was so beautifully presented. Yes, the vegetables beside the sea bass looked like a beautiful floral arrangement! Could be the most colorful food we’ve ever seen. We have spent a lot of time in Amsterdam lately and it is fast becoming one of our favorite cities. It’s so easy to get smitten with this great city! What a wonderful experience. The Dylan Amsterdam looks delightfully luxurious. I like the idea of High Wine. High wine really was a novel twist. I hadn’t heard of it before. Just this evening at dinner, I think I decided to make my first visit to the Netherlands this September and, of course, your post has only reinforced that decision. I enjoyed following along during your meal at Vinkeles via your photos and narrative, but I confess that it was a little heavy on organ meat for my taste—the beautiful presentations notwithstanding. Amsterdam is an absolutely great city! What a nice thing to look forward to. What a new perspective on accommodations there! I absolutely love your bedroom alcove. 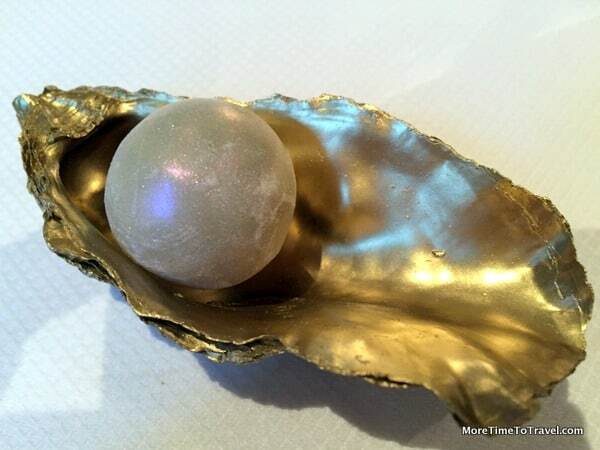 But the food seem so exotic although I was really struck by that edible pearl!!! A woman’s good friend, no doubt. I was amazed how much detail went into designing the room interiors, each one different! What a fabulous place to stay and I really enjoyed reading the history of The Dylan Amsterdam. Thanks especially for the photos so I could picture the rooms and surroundings. Your location was perfect and I love the thought of lying in bed looking at the stars. Hope to visit this city someday! Charming room, and the food looks spectacular. Going to have to save up and try this place on the next trip to Amsterdam. What a glorious place to stay while in beautiful Amsterdam! And the food…!!! What a spectacular hotel! I had the pleasure once of visiting it for a brief tour and had placed it at the top of my to-stay list for the next time I am in Amsterdam. Your images convince me to leave it there. What a fun adventure to be able to stay in one — well actually two — canal row houses along a canal. And your food looks awesome. Kudos to your wonderful descriptions and your husband’s great photography!! What a great rendering of a very interesting experience. And the meal looks just delicious, thanks in part to your awesome photos! Yes, definitely a memorable hotel to which you want to return! It’s always a treat to have a bathroom window, especially one with such a beautiful view.